My gift to you - this week only! 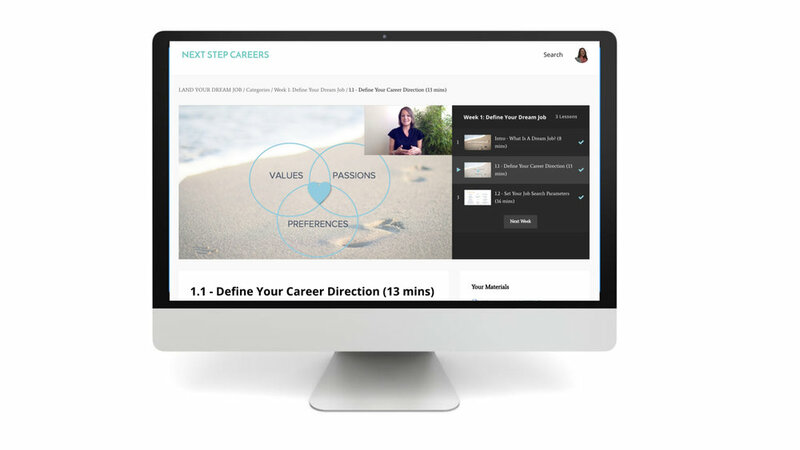 I'm giving you special access to my Define Your Dream Job training (Week #1 of my award-winning 9-week online course) for just $17 AND personalized feedback from me for FREE! CLAIM 'DEFINE YOUR DREAM JOB' NOW! I’ve helped thousands of job seekers use my simple process to figure out their right-fit career path. I can’t wait to help you do the same, and finally have the clarity and momentum you need to get out there and land your dream job. This opportunity is TIME-LIMITED and you have until SUNDAY to claim it! Learn what a "dream job" IS and HOW people are finding theirs today. You'll get perspective on how to plan for long-term career happiness. Complete exercises to uncover your Values, Passions, and Workplace Preferences (VPPs) - the three most important aspects of finding a career that fits. Strategically identify, explore and evaluate your strong-fit career paths, working off of clear criteria that will guide your entire search. Gain unshakable confidence in your career direction, eliminating your career anxiety and setting you up for a successful job search and a truly joyful career. BONUS - get direct, personalized feedback from me on how to make sure you're choosing the right path for you! Normally, the only way to get access to Define Your Dream Job is by joining my full, 9-week Land Your Dream Job program that costs $397. ...I want to give you the opportunity to overcome that greatest hurdle and propel yourself forward on the path to landing a job you love and deserve. I know how hard it is to wake up and know something's missing but not be able to put your finger on which career would fit you and make you happy. What you DO deserve is to feel CONFIDENT in where you're headed, which is completely possible and within reach. PLUS access to our Members-Only LYDJ Facebook Group where you can ask me ANY questions you have throughout your job search! Just click below to claim your seat and get started today! CLAIM YOUR SPOT IN 'DEFINE YOUR DREAM JOB' NOW! As a job seeker, your time and your money are precious resources. I know this from personal experience, which is why I'm giving you this one-time opportunity to get access to this powerful module from my course for just $17, AND I give you a full 2 months to go through the training and see the amazing results for yourself. If you're unsatisfied in any way, just shoot me an email within 60 days of purchase and I'll give you a full refund. No questions asked. Truly. After this week, the only way you can get access to Define Your Dream Job is by joining the full LYDJ program. "YES, I want and deserve to quash my career anxiety, and feel confident in where I'm headed." You DO deserve it, and I can't wait to help you make it happen. Questions? Send me a note at [email protected]. Otherwise, just click the link below to claim your spot -- I can't wait to see you soon in our LYDJ Members-Only Area!